This week's theme for the Thursday Photo Challenge is round, ovoid,... Boy did that suit me for fitting with Easter. You will see elsewhere what we did with this in watercolor class. These are blown Easter eggs I decorated with crayon resist and dye. Caran D'Ache wax crayons are very strong colors that draw very smoothly and finely. Draw on the egg so that you have enough pigment and wax built up to resist the dye bath. The dye will go wherever the crayon is not. It's great for florals, patterns and gardens. See the little apple tree on one of the eggs? I drew that on the egg along with some ground details, then dipped the sky part into blue dye and the ground into green dye. The egg with the stripes and floral patterns was done with crayon and watercolor. The watercolor does not take as well on eggshell as dye does and sometimes it manages to stick over the crayon. This week, (I know, I'm late posting this) for the Thursday Photo Challenge the challenge is Patterns, textures...My first thought was to photograph some of the origami objects I've made over the years from papers I've decorated. The tiny books in the back are an inch high. Then while working on this week's project for the adult watercolor class I teach, I realized the pattern on the crocuses fit perfectly with the theme too. So, you see them first. This week's theme for the Thursday Photo Challenge is Energy ( children, athletes, nuclear power plants, gas pumps, electrical power lines...) I imagined I would assemble some elements or objects that I thought related to energy: a candle, some sugar, a potato, running water, the stove burner, a cat jumping, a dollar bill. I don't remember what else I had in mind. 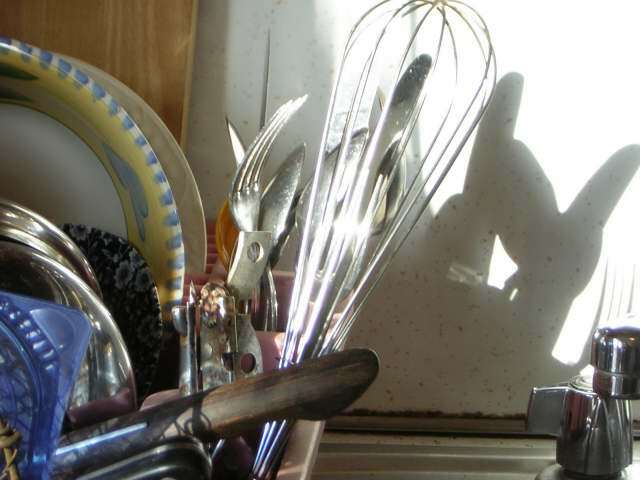 As I sat reflecting, my eye fell upon the dishdrainer with the sun blaring off the silverware back at me. There it is! The sun itself - all small in my house. And so, this is my offering to the theme of energy.